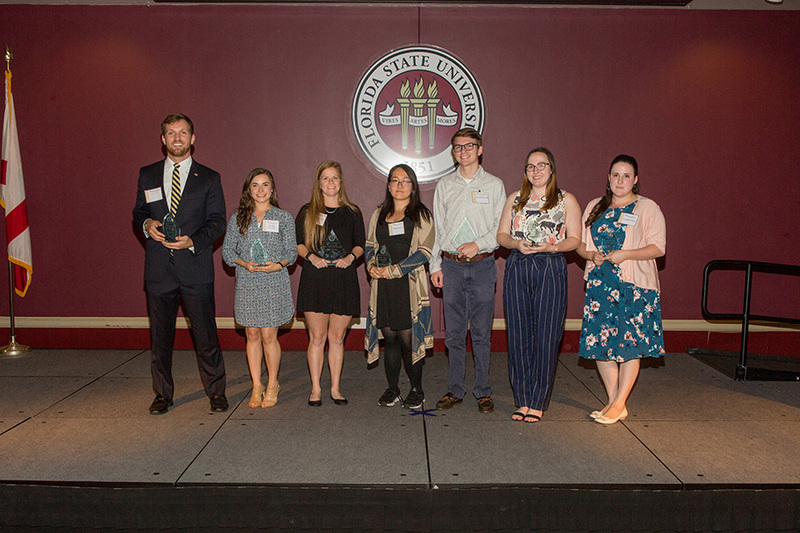 The Florida State University Career Center hosted its fourth annual Student Employee of the Year Awards ceremony April 9, celebrating the positive impact student employees have on the Florida State community. “The Student Employee of the Year awards are an incredible opportunity for the FSU community to thank our unsung student employees for the essential work they do to keep our campus thriving,” said Matt Kilduff, graduate assistant and event coordinator for the ceremony. The Artes (Skill) Award recognizes student employees who best demonstrate critical thinking skills in the workplace: Rosalia Parrino, Campus Recreation, and Georgia Platt, Department of Biological Science. The Mores (Character) Award recognizes a student employee who exemplifies outstanding professionalism in all aspects of the role: Blake Tipping, the Career Center. The Torch Award recognizes a student employee who displays exemplary customer service: Grace Atkins, Opening Nights. The Undergraduate Tony DiBenedetto Student Employee of the Year Award, named in honor of a former FSU student employee and prominent alumnus, is bestowed upon an outstanding undergraduate student employee who demonstrates strength, skill and character while delivering exceptional customer service and always going above and beyond the duties of the role: Wyatt Harrell, College of Motion Picture Arts. The Graduate Tony DiBenedetto Student Employee of the Year Award, named in honor of a former FSU student employee and prominent alumnus, recognizes the unique contributions of graduate student employees on campus and is bestowed upon an outstanding graduate student employee who demonstrates strength, skill and character while delivering exceptional customer service and always going above and beyond the duties of the role: Kelly Borges, FSU Athletics. DiBenedetto, chairman and CEO of Tribridge Technology Company, credits much of his growth and development to the skills he learned during his time as an FSU student employee. The ceremony, held in conjunction with National Student Employment Week, April 8-14, highlights the university’s appreciation for its student employees’ daily contributions and the welcoming atmosphere they create on campus. To further celebrate FSU’s student employees, the Career Center is encouraging FSU departments to share photos of their student employees using the hashtag, #NolesAtWork. For more information, visit career.fsu.edu.